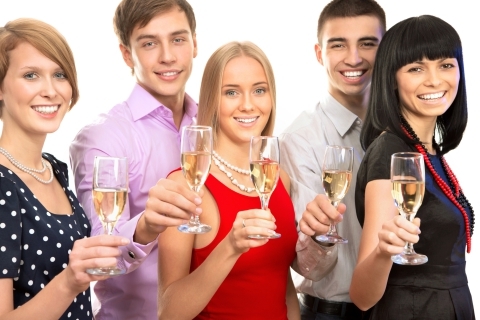 Do You Know How Alcohol Affects Your Oral Health? Hello, and welcome back to our blog! Here at Balboa Victory Dental Office, we want to help as many people in the Encino area as possible maintain good oral hygiene. While we have spent multiple blog posts covering the typical oral hygiene health tips that every dentist recommends, this short blog series is dedicated to a detrimental force that is not as often talked about in relation to oral hygiene: Alcohol. In today’s post, we are going to pick up where we left off last time and continue to cover some of the most common effects that alcohol has on an individual’s oral health. We hope that by the end of this post you understand just how important it is to maintain good oral hygiene and why it is in your best interest to have regular checkups with your dentist. When you consider the most important parts of the human body, many people will list the heart, brain, and liver at the top of the list. While these parts of the body are undoubtedly important, people often forget to think about how important their teeth are. Without teeth, people cannot properly chew their food and, in some extreme cases, damage to the jaw can result from missing teeth. In our opinion, it is much easier to make sure that your teeth are healthy than it is to deal with the consequences of tooth decay and gum disease. 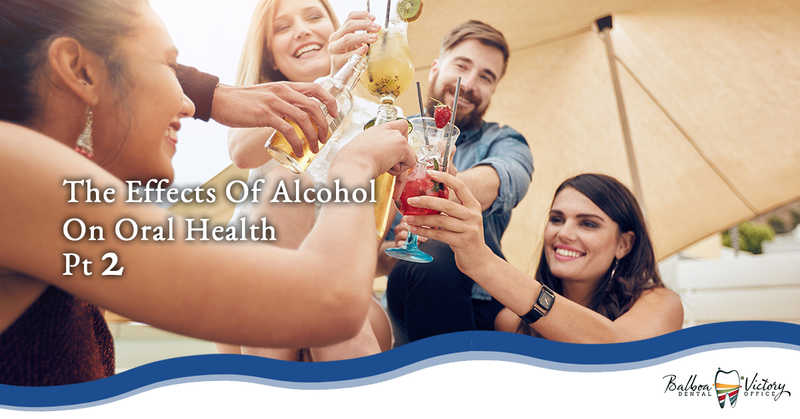 With this in mind, below we have listed out a few more reasons that it is important that you keep your oral health in mind when consuming alcohol. Staining: Few things seem to trigger people’s self esteem in the way that stained teeth do. The teeth whitening is a billion dollar industry in America and every year millions of people take drastic measures to make sure that their teeth are as white as possible. While people are well aware fo the fact that liquids such as coffee and soda can lead to the staining of teeth, fewer people are aware of the fact that alcoholic beverages can cause just as much damage. Alcoholic beverages such as red wine, sangria, and dark beers and liquors have been shown to stain teeth and can result in long-lasting discoloration and overall dullness of the teeth. Again, the best way to avoid this side effect of alcohol is to limit the amount of dark alcohol that you drink, however, you can also use water to rinse your mouth after drinking or take it a step further and brush your teeth soon after you are done enjoying your beverage(s). Gum Disease: Perhaps one of the worst side effects of alcohol consumption in relation to oral health is the fact that alcohol can hasten the development of gum disease. Gum disease, or periodontitis as it is referred to in the dental community, results primarily from a buildup of bacteria in the mouth. As we discussed in our previous blog, the sugars in alcohol help feed that bacteria that is naturally present in the mouth, while simultaneously reducing the amount of saliva that is produced. These two factors combine to create the perfect breeding ground for bacteria to wreak havoc on your gums. Again, the best way to mitigate this negative effect is to reduce the amount of alcohol consumed in one sitting, however, other methods to combat this side effect include alternating alcohol and water and brushing your teeth after you are done drinking. We hope that this short blog series has shown just how important it is for individuals to take their oral health seriously and consider the risk factors associated with alcohol consumption as it relates to oral health. If after reading this blog series you feel that you need to have your mouth looked at, contact us today at Balboa Victory Dental Office in Encino. Our staff is dedicated to helping all of our patients achieve their oral health goals and we will help you maintain a healthy mouth. When it comes to your oral health, don’t settle for second best. Contact us today and let us show you why we are one of the most trusted dentists in the area.